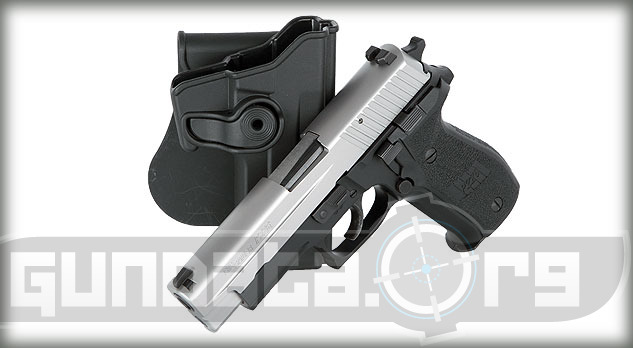 The Sig Sauer P226 Two-Tone is a large frame, semi-automatic pistol, designed for competitive, recreational, and self-defense shooting. The original P226 was introduced as a design to replace U.S. military sidearms in 1984, and although the contract wasn't rewarded outright the Navy Seals picked up the weapon as their sidearm of choice. Sig Sauer tests all P226 models for accuracy at a range of 25 meters before they're introduced to the commercial market. It has a decocking lever on the left side of the frame, along with left side controls, and an ambidextrous thumb safety switch. 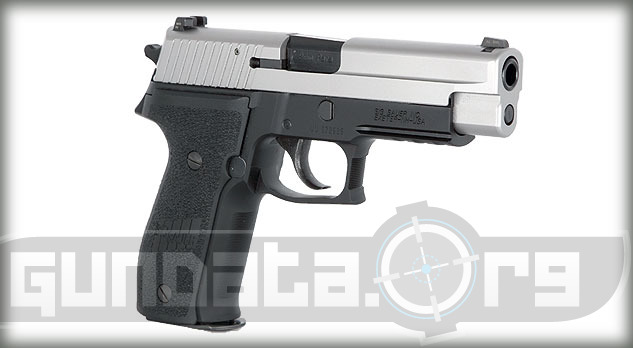 The overall length of the P226 Two-Tone is 7.7-inches, with a height of 5.5-inches, and a barrel length of 4.4-inches. The frame material is made from aluminum alloy, and has a black hard coat anodized finish. The slide material is made from stainless steel, and has a natural stainless finish. The grips are black polymer with front strap serrations. 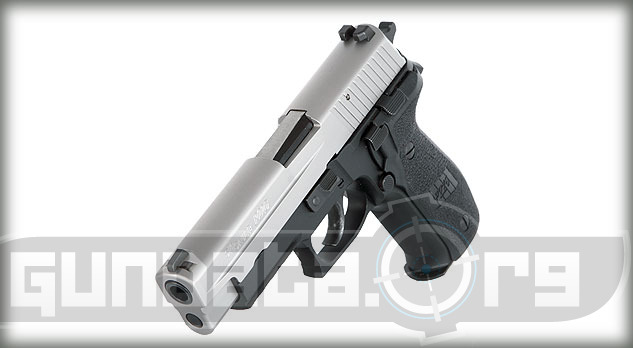 It holds a 15-round clip of 9mm ammunition, or 12-rounds of .357 SIG or .40 S&W. The trigger is double and single action, with a pull of approximately 4.4-pounds on the single, and approximately 10-pounds of pull on the double. The sight system comes in either contrast or the 3 white dot SigLite night sights.